We're at day number four, post-Thanksgiving, and most of my leftovers are gone now except for a slice or two of ham, an itty bitty bowl of green beans and one giant ham bone. My favorite part about holiday ham has always been the bone because all I can think about (after the meat has been sliced off it) is that it'll make one mighty fine tasting soup. The same goes for rotisserie or roasted chicken. I never discard the carcass because there is still so much flavor left in the bones and they're just perfect for flavoring soup. 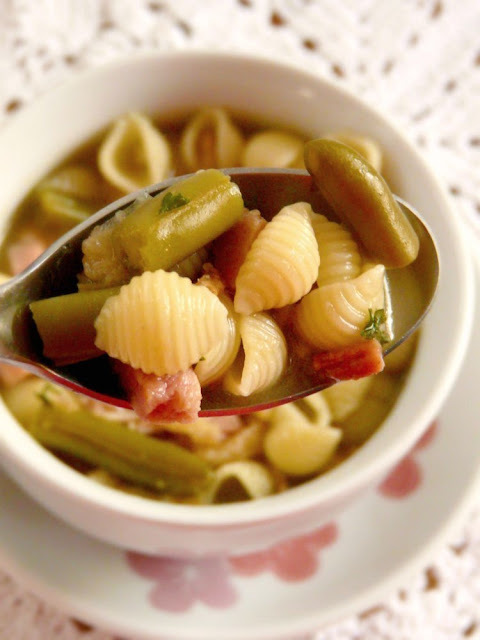 I cooked up the remaining leftovers today in the form of this ham soup for lunch and it was superbly flavorful. If all you have left is a turkey carcass, by all means, use that instead. 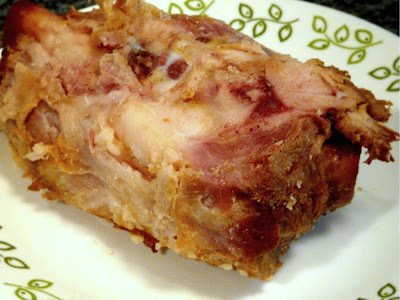 This recipe will work well with ham or turkey or whatever carcass you have on hand. 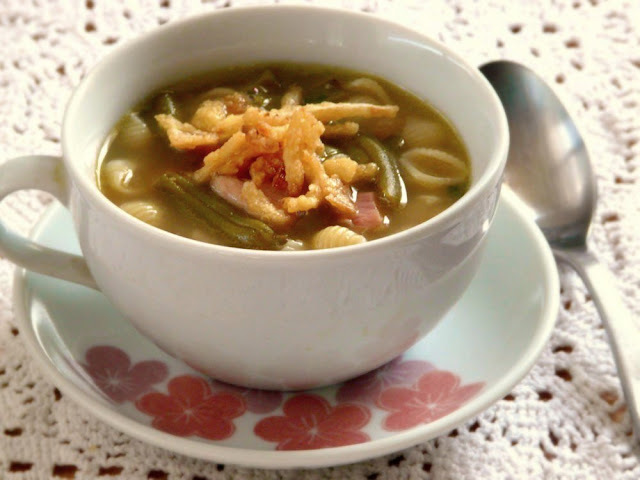 It's a rustic, thrown together kind of soup that's delicious and comforting so I hope you'll give it a try! Start by preparing the stock. Remove as much fat and skin as you can from the bone or carcass. Place it into a stock pot and fill with enough water to cover it. Add the chopped carrots, celery and onion. Don't bother too much with prepping these vegetables as they're merely for flavoring so just cut them up into large chunks and throw them in. Next, add the bay leaves and peppercorns. 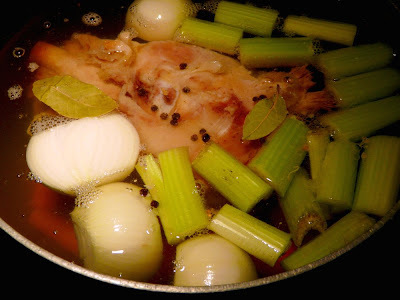 Bring the stock to a boil then reduce the heat and let simmer on low (the lowest you can go) for 4 hours. Check it periodically and remove any scum that you see on the surface. After 4 hours, fish out the bone and remove the vegetables with a slotted spoon. Strain the stock through a fine mesh sieve and then run a spoon along the surface to remove as much oil and fat as you can. Alternatively, you could also let the pot cool then store in the fridge for several hours or overnight. All the fat would have hardened on the surface making it easy to just scoop off. Now that your stock is ready, it's time to put the soup together. You can store any unused stock in plastic containers and freeze them for up to year. Heat a couple tablespoons of olive oil in a large pot. Saute the minced garlic until fragrant then add the diced ham and continue sauteing until browned. Add 6 cups of stock, white wine, thyme and parsley. Bring to a boil then add a cup of small pasta. Simmer until the pasta is just about tender. Add the leftover vegetables and continue simmering for another minute or two. Remove from heat and season to taste with salt and pepper. Top with fried onion bits and serve immediately. Enjoy!